Well interventions are utilized to avoid unforeseen problems in oil and gas wells; clean and remove debris before completion; safely suspend production during storms or planned maintenance; conduct remediation and stimulation to rejuvenate production; sidetrack existing wells to reach new targets; and carry out safe and effective plug and abandonment at the end of the well’s economic life. The world is moving toward the usage of renewable sources of energy. However, demand for oil & gas has not declined. Reliable power is a basic necessity due to the continuous development and modernization of society. Renewable energy sources provide clean power. However, they are yet to become reliable power sources as they require backup in the form of hybrid power plants. Therefore, the demand for oil and gas is rising, but at a sluggish pace in comparison to its previous growth. Furthermore, rapid depletion of oil reserves is influencing the outlook of the global oil and gas industry. Hence, efforts are being undertaken to explore new oilfield reserves, particularly in North Sea, South China Sea, Gulf of Mexico, and the Persian Gulf, in order to cater to this ever increasing demand. This, in turn, is anticipated to offer substantial expansion opportunities to the well intervention market in the near future. Maximizing production from brownfields and extending the plateau have become utmost priorities for exploration and production companies across the world. Rise in awareness about maximizing field production involves not only having a clear understanding of subsurface intricacies but also ensuring that existing surface facilities are performing at their best in order to handle production in an environmentally safe manner. Consequently, operators of mature oilfields are searching for late-stage intervention solutions that can revitalize aging, marginal wells, bringing them back online in order to extend production. Globally, an estimated 20,000 idle wells have been identified for abandonment, 45% of them in the highly regulated Gulf of Mexico (GoM). Production companies might have chosen to abandon a well once it shifted from an asset to a liability in the recent past. Declining prices of crude oil have resulted in a halt of several well intervention projects. This has triggered investments in the renewable energy business owing to government support and regulations pertaining to carbon emissions. High investments in solar and wind power technologies have shifted the focus toward clean energy, which has hampered expansion of well intervention services globally. However, stability in prices of crude is expected to provide significant opportunities for well intervention services across the globe for new discovery as well as existing oil wells. The subsea offers several challenges for oil and gas exploration and requires planning in advance. Consequently, the oil and gas industry is engaged in a growing movement to identify advanced techniques and technologies that can help it maximize revenues from existing brownfields and new assets by enhancing their output and pursuing a safer and more cost-effective best practice approach. Several major oil and gas companies still do not have established subsea intervention policies. This is, however, slowly changing, as an increasing number of oil and gas companies have begun to embrace the need for performing more regular interventions on their growing portfolios of subsea wells. Nonetheless, organizational structures and incentives for conducting interventions typically remain insufficiently aligned to support full adoption of regular subsea intervention programs across global well-stocks. Furthermore, oil and gas companies are exhibiting an increasing interest in improved recovery rates from existing and future subsea wells, as the aging installed base of around 5,500 subsea wells at year-end 2014 is set to surpass 7,000 by 2019. Demand for cost-efficient well intervention solutions is increasing due to a substantial gap in recovery rates between subsea and platform wells of between 25% and 40%. In April 2016, Schlumberger Limited acquired all the outstanding shares of Cameron, a leading provider of flow equipment products, systems, and services to the oil and gas industry. Through this acquisition, the company plans to create technology driven growth by integrating Schlumberger’s reservoirs and well technologies with the wellhead and surface equipment, flow control, and processing technologies of Cameron. The company is anticipated to provide the industry’s most comprehensive range of products and services from exploration to production, as well as integrated pore-to-pipeline solutions that help optimize hydrocarbon recovery in order to deliver reservoir performance. In February 2018, Schlumberger Limited launched the motion-compensated intervention tower for rigless well intervention expedites on deepwater tension-leg platforms. In January 2018, Halliburton was tasked with developing and delivering an integrated well intervention campaign, plugging 20 wells in an offshore field off Norway at the lowest cost possible. This included providing project management, engineering, personnel, equipment, and services. A creative, customized solution was needed to produce a low-cost, effective solution. Considerable collaboration with the customer and detailed well analysis are likely to be needed to determine the appropriate solution in order to meet project requirements at the lowest cost possible. The global well intervention market is highly fragmented with a large number of local and international players competing in the market. Leading players dominate the market. Key players operating in the well intervention market are Schlumberger Limited, HELIX ESG, GE, Halliburton, Oceaneering International, Inc., Expro Group, Hunting Energy Services, National Oilwell Varco, Deepwell AS, and Weatherford International Plc. A well intervention or well work is any operation carried out on an oil or gas well during or at the end of its productive life. The intervention alters the state of the well or well geometry, provides well diagnostics, and manages the production of the well. It enables safe entry into a well with well control in order to carry out numerous tasks other than drilling. The history of well intervention dates back to the 1800s, when the technology was first developed to afford re-entry into wells as an alternative to drilling well control systems and rigs for delivery of non-drilling services. Demand for well intervention services in offshore areas has been increasing due to rise in demand for crude oil and fuel, increase in preventive steps taken for aging wells, rise in the number of drill rigs, and decrease in productivity of various gas and oil wells. Globally, more than 1,800 onshore rigs were estimated to exist in 2017. However, the number of offshore rigs was about 500 in 2017. Demand for well intervention services in offshore oil & gas wells is expected to rise at a higher pace during the forecast period as compared to that in onshore oil & gas wells. This is attributed to new discoveries in offshore area and rise in investments in exploration and production activities in the offshore oil & gas industry. This report analyzes and forecasts the well intervention market at the global and regional level. The market has been forecast based on revenue (US$ Mn) from 2017 to 2026, considering 2017 as the base year. The study includes drivers and restraints of the global well intervention market. It also covers impact of these drivers and restraints on demand for well intervention during the forecast period. The report also highlights opportunities in the well intervention market at the global and regional level. The report includes detailed value chain analysis, which provides a comprehensive view of the global well intervention market. Porter’s Five Forces model for the well intervention market has also been included to help understand the competitive landscape. The study encompasses market attractiveness analysis, wherein products and applications are benchmarked based on their market size, growth rate, and general attractiveness. The study provides a decisive view of the global well intervention market by segmenting it in terms of type, services, application, and region/country. In terms of type, the well intervention market has been classified into light well, heavy well, and medium well. Based on services, the well intervention market has been divided into coiled tubing, slickline, wireline case hole intervention, thru tubing intervention, fishing services, sidetracking, subsea landing string services, and others. In terms of application, the global well intervention market has been categorized into onshore and offshore. These segments have been analyzed based on present and future trends. Regional segmentation includes current and forecast demand for well intervention in North America, Europe, Asia Pacific, Latin America, and Middle East & Africa. The report provides the actual size of the well intervention market for 2017 and estimated size for 2018 with forecast for the next nine years. The global well intervention market has been provided in terms of revenue. Market numbers have been estimated based on type, services, and application of the well intervention market. Market revenue and size have been provided in terms of global, regional, and country level markets. The report comprises profiles of major companies operating in the global well intervention market. 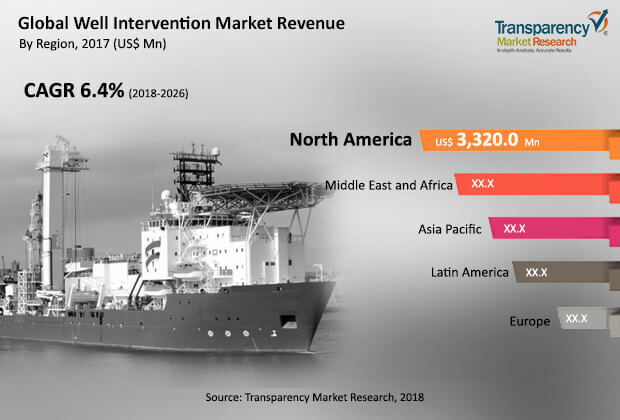 Key players operating in the well intervention market include Schlumberger Limited, HELIX ESG, GE, Halliburton, Oceaneering International, Inc., Expro Group, Hunting Energy Services, National Oilwell Varco, Deepwell AS, and Weatherford International Plc. Market players have been profiled in terms of attributes such as company overview, financial overview, business strategies, and recent developments. Light well type well intervention is widely used as compared to other types. Light well intervention accounts for approximately 49% share of the market. North America holds a significant share of the market. This trend is projected to continue during the forecast period.